If you’ve ever been curious about the ingredients used in anti-aging products, then chances are that you’ve come across peptides before, as well as the miraculous claims that companies make about the peptides that their products contain. 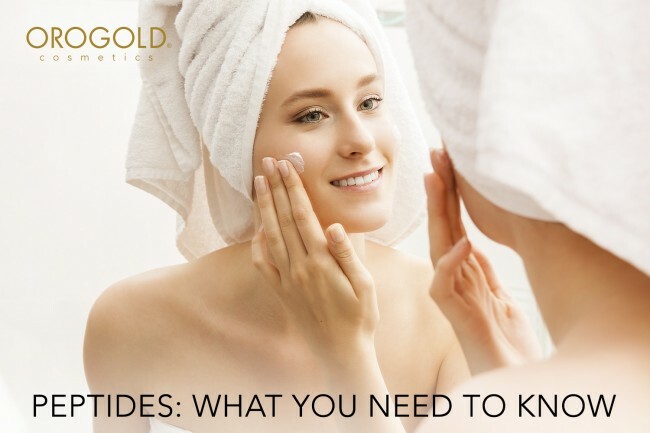 OROGOLD takes a closer look at peptides, explaining to you what they are, how they work, and whether skin care products that contain them are worth investing in. Peptides are chains of amino acids, and are basically the building blocks for proteins. When the peptides form a short chain of amino acids, these are able to penetrate into the top layer of the skin and send signals to our cells, letting them know how to function. When the peptides take the form of long chains of amino acids, they become proteins. While the peptides in the skin have been formed naturally, the peptides that you will find in the majority of skin care products are synthetic and created in a lab, as this gives scientists greater control over the stability and effectiveness of the ingredients. While peptides may not be all-in-one miracle workers, they do bring some great benefits to the skin. There are also many different types of peptides, although there are a specific few that are commonly used in skin care products. Pentapeptides are the most common form of peptides that are used in skin care products, with some specific examples including Matrixyl and Myristoyl Pentapeptide. Made up of five peptide units that have been linked together, pentapeptides are able to stimulate the production of both collagen and hyaluronic acid, both of which decrease as you age, making pentapeptides a great ingredient for those who want to prevent wrinkles and sagging skin. Copper peptides link up with copper molecules before making their way deep within the layers of the skin. Once there, they are able to stimulate the production of collagen, as well as promote the healing of skin. However, there is still much more research that needs to be done on the individual effectiveness of copper peptides, as well as to compare how effective they are in relation to other anti-aging ingredients, such as vitamin C.
One of the most innovative forms of peptides, neuropeptides affect the neurotransmitters in the skin, resulting in the nerve cells ceasing any communication and being able to simply relax. This then relaxes the facial muscles, giving the skin a smoother appearance and eliminating any wrinkles. Peptides are an extremely effective anti-aging ingredient, but, just like any other anti-aging ingredient, need to be used over a long period of time, at least four to six weeks. Peptides also need to be combined with other effective anti-aging ingredients in order to enjoy for them to work to the best of their abilities. OROGOLD reminds you that upkeep is the most important part of using peptides, and if you were to cease using them, you would notice the difference very quickly.